The Black and Alec’s first encounter at the beach. One of the rare movies that achieves a magical atmosphere. Seeing it is like being carried on a magic carpet; you don’t want to come down. (it may be the greatest children’s movie ever made.) In this first feature by Carroll Ballard (as in his earlier short films and documentaries), the visual imagination that he brings to the natural landscape is so intense that his imagery makes you feel like a pagan – as if you were touching when you’re only looking. His great scenes have a sensuous trancelike quality. The movie is set in 1949, but it seems outside time. And this distilled atmosphere makes it possible for a simple boy-and-animal story to be transformed into something mythological. The boy’s sense of wonder recalls “Pather Panchali”, but there are elements of Arabian Nights fantasy that suggests the 1940 “The Thief of Bagdad”, without that films theatricality. 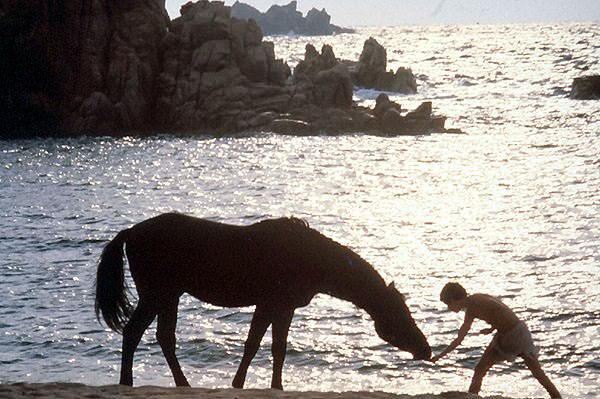 When the boy, alone on a desert island with the horse, woos him with a gift of seaweed and finally rides him, you may agree with the man who said that when he saw the movie he felt that he was rediscovering the emotional sources of mystery and enchantment. With Kelly reno as the eleven-year-old boy, and Mickey Rooney, Hoyt Axton, Teri Garr, and Clarence Muse. Based on the 1941 novel by Walter Farley; the screenplay is by Melissa Mathison (who later wrote “ET”), Jeanne Rosenberg, and David D. Witliff. The cinematography is by Daleb Deschanel; the editing is by Robert Dalva. (Arabian-Horse-World, April 1978) The lights will dim, the curtain will rise, and before there’s time to say Francis Ford Coppola the movie magic of Walter Farley’s THE BLACK STALLION® will unfold on the screen before us. It will all seem quite natural and believable, those incredible feats and heart-thumping adventures. 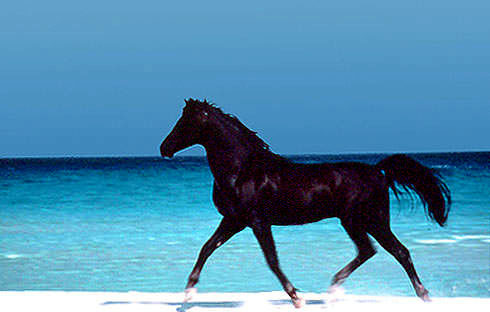 But the production story behind THE BLACK STALLION® almost equals the drama that takes place on the screen. THE BLACK STALLION® is certainly the toughest horse film ever undertaken. Thousands of miles were traversed to kind the right locations necessary for the film, which ranged from period sets resembling Flushing, N. Y. of 1947, to a barren, uninhabited island in the Mediterranean. Two racetracks were required, as were the special effects of a large ship sinking at sea in a violent storm. 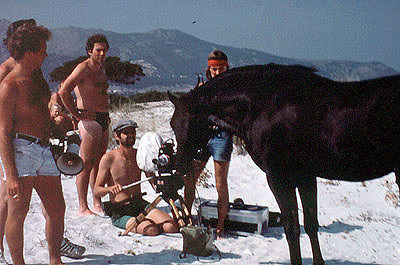 Most of the action required exterior shooting, leaving both horses and crew at the mercy of prevailing weather. And there was the most unpredictable element of all to deal with, horses which had to perform unique and difficult stunts, frequently in almost inaccessible and dangerous locations. 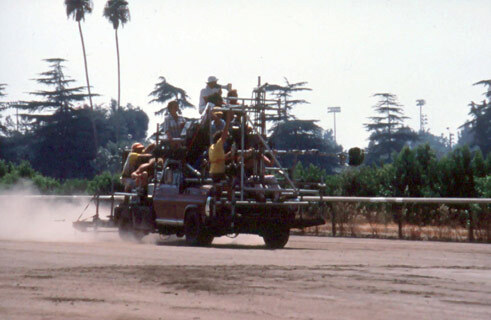 The first logistical problem was finding an equine star to match the legendary beauty, size and majesty of the “most famous fictional horse of the century.” Producers Tom Sternberg and Fred Roos and director Carroll Ballard spent months searching for the appropriate Arabian stallion, traveling to England, Morocco, Egypt and throughout the United States. At last they found their “star” in San Antonio, Texas— CASS OLE’, one of the most honored Arabian show horses in the United States, owned by 18-year-old Francesca Cuello. He was the Black Stallion®. His rare beauty would thoroughly captivate an audience, and he had the willingness and intelligence to perform the demanding stunts required of the role. Realizing from the start that no one horse could have the full range of attitude and expression necessary for the Black Stallion®‘s transition from terrifying wild stallion to beloved companion, three other horses were trained with CASS OLE’ for the production. FAE-JUR, an Arabian stallion from the Jack Tone Ranch in Stockton, was chosen by director Ballard for his unique liveliness, and two horses owned by stunt coordinator Glen Randall, Jr. were trained more specifically for the fighting and running stunts. 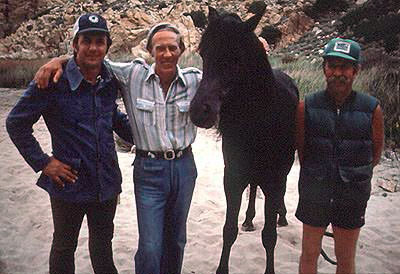 All four horses were brought together at the Randall Ranch in Newhall, Cal, in the spring of 1977 for an eleven-week training session before the filming began. Joining them for several weeks was actor Kelly Reno, who plays the role of Alec Ramsey. An excellent rider, Kelly trained with CASS OLE’ and established a rapport with his equine costar that would add immeasurably to the film. At the end of the training session the horses had been taught to respond to basic visual and vocal commands for such actions as coming when called, being sent away, fuming, walking backwards and laying their heads down. In addition to these standard movements, the horses also learned to put their ears back to show anger, rear, paw the ground, stomp a snake, nod their heads, simulate a kiss with their mouths and lie down. By the time the cameras were ready to roll, the production had its loving horse, its bucking horse, its wild horse and its racehorse. Film production divided into two distinct halves as locations were settled. Sardinia was chosen for the island sequences of the film because of the spectacular remote areas of its coast; and Toronto, Canada, was selected as a perfect match for the eastern seaboard of the United States in the late 40’s. Separate production managers and art directors were chosen to oversee the two phases of production, one with largely a Canadian crew, and the other with an Italian crew. Filming began in Toronto on July 4, 1977. 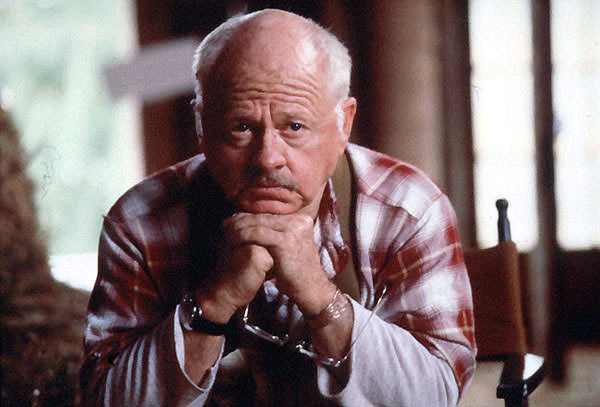 For the sets of Henry Dailey’s (Mickey Rooney) farm and team interiors, two bucolic locations were found in the greater Toronto area about 40 miles from the city center. An abandoned barn, slated for eventual destruction as the site of a new international airport, was refurbished by art director Earl Preston to reveal magical qualities. With light streaming through its 100-year-old frame, an inviting home for the Black Stallion® was created.Two different racetracks were needed, one for the sneak training sessions at night, and another for the match race taking place in Chicago. Fort Erie Racetrack, located on the Ontario border not far from Buffalo, N. Y. was perfect for the 1947 period track with its wooden stands and roof, and Woodbine Racetrack in Toronto was chosen for the night sequences. With the help of the Ontario Jockey Club, a special All-Star Jockey Invitational Race at Fort Erie, including such celebrities as SEATTLE SLEW’s winning jockey Jean Cruguet, was promoted to fill the stands for the filming of the great match race. A huge crowd was drawn to witness the event, but the weather proved uncooperative— rain forced a delay in shooting until the following week, and time was too short to reassemble another full capacity crowd for the second attempt. Inclement weather would plague the entire Canadian operation. The summer of ’77 was one of the rainiest and hottest on record, with one day’s temperature recorded at 115 degrees. During the night shooting at Woodbine Racetrack, torrential rain created a two-foot-deep mire of mud on the track, further delaying production. Second unit shooting, covering a major part of the action where the Black Stallion® runs rampant through an industrial section of the city, proved very successful although complicated by the problems of crowd control. Obtaining permission to use city streets was not an easy task, as Toronto officials were reluctant to risk the dangers of having a “wild” stallion running at will among streetcars, pedestrians and sidewalk stands. At the end of August, a thoroughly wet and weary crew headed for the sunnier clime of the Mediterranean, but here a whole new set of problems imposed by remote locations and difficult terrain had to be solved. Horses were transported in one large van which contained portable stalls to be set up and disassembled at each location, while the crew traveled in a caravan, crisscrossing the island. The first location was the town of Marina di Arbus on the rugged western coast of the island. Access to one area involved a tortuous trek over high sand dunes, with all the camera equipment being hand-carried in and out of the site – a situation the crew learned to accept all over Sardinia. Arbus was the site of two of the most difficult stunts in the film. The first required the Black Stallion® to swim to shore, dragging young Alec behind him. A feat which posed some unique problems. A special barge had to be constructed on which to load the horse and transport him out to sea to his starting position for the swim to shore. The barge, designed by art director Aurelio Crugnola, was trucked into the location in pieces and assembled under the watchful eye of water specialist Giorgio Gallani. The whole population of Arbus gathered on the beach to help with the assembly and watch the exciting launch, certainly a “happening” for the tiny and remote village. The first attempt at loading the horse onto the barge failed and horse trainer Corky Randall suffered a head injury in the attempt. Thoughts turned to abandoning the project, but eventually the horse became accustomed to the water, and the barge proved invaluable. The second stunt filmed at Arbus made everyone uncomfortable: a group of deadly cobras were flown in from Milan with their handler Carlo Guidi for the scene in which the Black Stallion® must stomp and kill a snake which is about to strike Alec. The fatal venom was milked from each snake before it was used and a special serum was on hand in case of emergency, but the knowledge that a cobra can travel twice as fast as two legs made everyone extremely nervous. The discomfort which accompanied these early stunts was not eased by the Spartan living conditions which faced the crew. With no hotel in town, they were quartered in a school dormitory which had no facilities. Exposure to sun, sand, sea and dysentery did not enhance the situation. It was with no small relief that the crew headed for the next location, Capo Caccia, a spectacular spot also on the western coast, where cliffs rise 800 feet from the sea. The spot was chosen for its rocky heights, requiring that all equipment again be hand-carried up vertical precipices. Yet the rigors of the location were more than compensated in the crew’s mind by the availability of a hot bath —the first in ten days. The third base of operation was La Caletta on the east coast of Sardinia. Filming was done at two nearby sites, Capo Comino and San Teodoro. Comino, one of the locations used by Lina Wertmueller in SWEPT AWAY, had originally been scouted months before as an ideal spot to stage the boy’s first ride on the Black Stallion®. But when the crew arrived for actual filming, the beach was covered with several feet of decaying seaweed, and another beach had to be substituted. San Teodoro beach, about 30 miles away, was judged to be perfect with its mile-long stretch of fine white sugar sand and wide sand bar reaching far offshore, adding greatly to the safety and ease of the horse action shots. In mid-September, the unit moved to its fourth location, Costa Paradisio. Truly remote, the beach was surrounded by imposing rock formations. Since it was accessible only by boat or a narrow stone path, it was necessary to lead the horses in over the mountains circuitously, a trip which took three hours each way. For the horse crew, the four week stay at Costa Paradisio was an exhausting ordeal, but three outstanding sequences of horse action were completed there: the wild “Black” attacks Alec at a fresh water rain pool when he comes to drink; starving, the stallion accepts and eats seaweed that Alec has found for him, and their friendship is established and the stallion swims out to the rescue ship when fishermen come and take Alec from the island. For the last sequence, special horses were imported from the swamplands of Camargue, France, where an amazing breed has developed which is specially adapted for swimming at sea. The use of these horses greatly lowered the risks entailed in some of the water action shots, and made possible the realistic and stunning shots of “The Black” swimming in the open sea. The final site was Cala Ganone, on the eastern coast and accessible only by boat. It too was one of the locations used by Line Wertmueller in SWEPT AWAY, and is especially famous for its grottoes. A constant frustration in shooting exteriors on Sardinia was the ever-present sign of civilization. Because the island in the story was totally uninhabited, a special detail of men was assigned each day to comb the beaches for litter and smooth out footprints which were found even on the highest, most inaccessible looking sand dunes. [filming was completed over a nine-week period, and despite the obstacles presented by the difficult terrain, director Carroll Ballard feels the varied and unusual beauty of Sardinia captured on film creates a spectacular backdrop for the movie. For the last major segment of the movie, cast and crew traveled to the Cinecitta Studios in Rome, where the sinking of the ship “The Drake” was to be accomplished. Two portions of the ship, the deck section and the stern, had been constructed in the studio’s outdoor water tank. Designed and executed by art director Aurelio Crugnola, the sets are the actual size of a passenger ship and the largest ever created in that tank. The stern section, set on a platform of five tracks with cables attached to pull the ship as it is sinking, was built in three parts, all upside down. These sections were then rolled on their right sides by a crane and assembled in the tank, a process which took three months. Interior sets constructed on the stages included staterooms, corridors and a drawing room, all specially designed and reinforced to withstand huge volumes of water and a wildly i kicking stallion. Fortunately, Crugnola was able to salvage several parts from an old ship slated for destruction, which were used for set decoration and props. When construction was completed, an authentic old art-deco passenger ship had been created. Filming was done during three weeks of night shooting. Precise coordination was required to provide the dazzling sequence in which the Black Stallion® makes his courageous escape from the sinking ship. A safe path had to be secured for the horse, as action involved a magnificent leap overboard and a swim through storm tossed waters while pulling Alec Ramsay safely to shore. Special effects included fire, rain, wind and high waves, and when all were put into action the noise was so deafening that communication on the set became nearly impossible. Music Supervising and Editing……………..Dan Carlin, Jr., La Da Productions Inc.
Second Unit Photographed by………………..Stephen H. Burum, A.S.C. Exquisitely filmed story of a young boy’s adventures with a magnificent black stallion – from a dramatic shipwreck to a racing championship. Too slow at times, but still worthwhile, with many precious moments, stunning cinematography by Caleb Deschanel, Rooney’s lovely performance as veteran horse trainer. Based on classic children’s novel by Walter Farley. 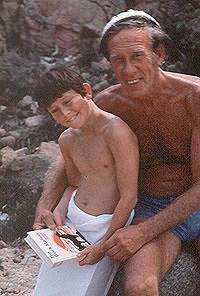 Followed by 1983 sequel, and TV series (with Rooney). Copyright Leonard Maltin, 1998, used by arrangement with Signet, a division of Penguin Putnam, Inc.
enthralling tale of a boy’s bond with a horse moving and enthralling tale of a boy who comes to terms with his loss and learns to survive with the comfort and love of a horse. Patience is required as it moves seemingly slow at times, but the drama of the story draws you in. Excellent children’s movie for a thoughtful child.